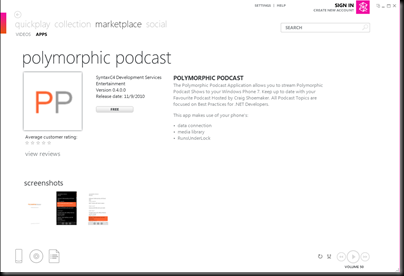 Polymorphic Podcast for Windows Phone 7 is Live! The first Iteration of the Polymorphic Podcast Application for Windows Phone 7 is now available in the Zune Marketplace! You can Download the Polymorphic Podcast Application for Windows Phone 7 by clicking on the metro download image below. Special Thanks to Craig Shoemaker [@CraigShoemaker] for creating the Podcast and Approving my Idea!